Jazz Ensemble is an extracurricular ensemble that meets after school during the Spring Semester and provides students the opportunity to perform music in jazz styles and related idioms such as rock and Latin. The group meets on average two days per week starting in January and ending in May. The ensemble performs as part of our band concert program and at local events. Standard instrumentation includes: alto saxophone, tenor saxophone, baritone saxophone, trumpet, trombone, drum set and auxiliary (such as vibraphone), bass, guitar, and piano. The Jazz Ensemble also accepts clarinets, baritones (if you read bass clef or are willing to transpose music), flutes (if you are willing to transpose music) and tubas. There is a $95 fair share assessment for membership in the ensemble which covers the cost of guest instruction, music and equipment. The full amount can be payed at registration, or as follows: $50 by 2/8; $45 by 4/19. In addition, new students are asked to purchase the uniform blue dress shirt at an approximate cost of $25. Complete uniform consists of black dress pants and shoes with the shirt. The fee for the shirt will be due when the shirts become available (most likely mid-February). Financial assistance is available through the booster organization for students who demonstrate need. No student should be discouraged to join due to the financial obligation; we will assist every family willing to contribute their “fair share”. 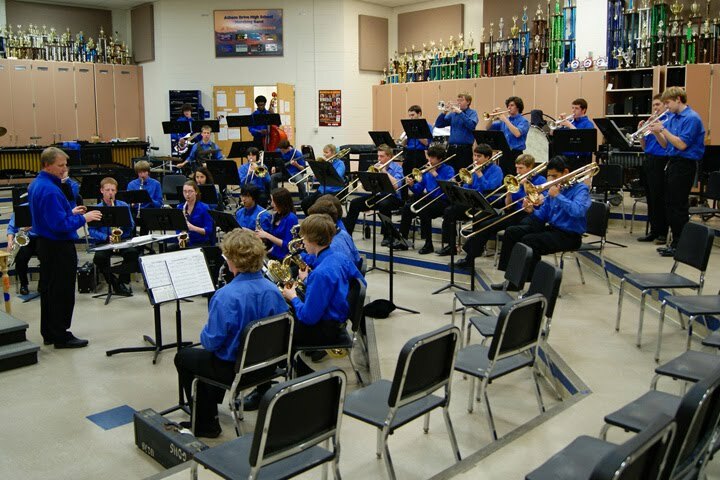 Upon deciding to participate in the Jazz Ensemble, each student—new and returning--must complete the Jazz Ensemble Registration Form on our "Forms" page and submit it online. Students are to submit a written request to be excused from any rehearsal or performance. It is expected that the students will attend every rehearsal and performance unless illness or other emergency prohibits participation. Any unexcused absence and/or problem with excessive absence may result in suspension from performance or dismissal from the jazz ensemble with no refund of fees.